In mid-November, Tauil & Chequer announced the promotion of Thais de Mello Rodrigues and Débora Yanasse. 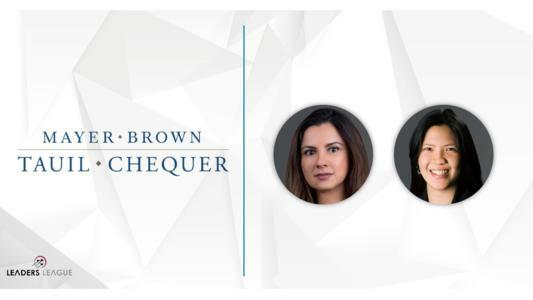 In mid-November, Tauil & Chequer Advogados in association with Mayer Brown announced the promotion of two lawyers from its corporate and tax departments to the partnership. The move comes as Mayer Brown announced a global wave of promotions which saw an additional 32 professionals reach partner-level worldwide. The appointments will be effective as of January 2019 and includes attorneys from Chicago, Hong Kong, London, New York, Paris and Washington D.C. as well as Débora Yanasse and Thais de Mello Rodrigues from Rio de Janeiro. New Corporate & Securities partner Débora H. Yanasse is an expert on the Brazilian power industry. She regularly assists clients from the generation, transmission, distribution, trade and consumption sectors with strategic regulatory, contractual and corporate mandates. With a Bachelor of Laws from Universidade de São Paulo (USP) and an LL.M. from Georgetown University, Ms. Yanasse has previously worked at Mattos Filho Advogados, the Inter-American Development Bank in Washington, Mayer Brown in New York as well as Tauil & Chequer itself. In 2013, she returned to Tauil & Chequer’s Rio de Janeiro office as counsel until her recent promotion to partner. New Tax partner, Thais Bandeira de Mello Rodrigues earned a Bachelor of Laws from Universidade do Estado do Rio de Janeiro (UERJ) and has been practicing tax law for over 17 years. Ms. Rodrigues began her legal career at Gaia, Silva, Rolim & Associados in 2002, before moving to Deloitte where, over a period of seven years, she rose to the position of tax manager. In 2011, Rodrigues joined Tauil & Chequer as an associate and has since focused on direct tax issues and regulatory mandates involving the Brazilian Central Bank and the Brazilian Federal Revenue Office. She is frequently sought out by high-flying domestic and international companies from the oil, gas and energy industries. With offices in Brasília, Rio de Janeiro, São Paulo and Vitória, Tauil & Chequer is a full-service firm which particularly stands out for its strength in oil & gas, real estate, infrastructure, environment and capital markets mandates. Clients benefit from the firm’s association with Mayer Brown, a global law firm which provides services across the Americas, Asia, Europe and the Middle-East.